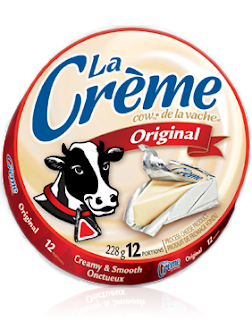 Parmalat Canada is excited about La Crème Cow - a new line of spreadable snack cheese adults will love, whether on-the-go or sharing with friends. It's available in three delicious flavours; Original, Light* and Parmesan and Peppercorn, and each wedge of cheese has a delicious mild taste with a very smooth and creamy texture. La Crème Cow spreadable cheese is a great everyday snack option because it is convenient - with each piece individually wrapped and easily stored in it's own container. The cheeses are great to create your own little wine and cheese party - perfect for Valentines' Day, snacks or when having friends over. The cheese can be eaten on it's own or paired with a nice flavored cracker.La Crème Cow also spreads nicely over bread, bagels & crackers. You can enjoy it over toast or bagel in the morning,as well as spread on a sandwich for lunch, pairing it with deli meat if you wish. There are currently 3 different flavours of La Crème Cow cheese. La Crème Cow cheese launched in August 2011 with 2 base flavours (Original & Light Original) and a New Unique Flavour to category, Parmesan & Peppercorn. Parmalat Canada would like to give one lucky Canadian reader an opportunity to win a $100 La Crème Cow prize pack .A random draw will be held by Random.org on January 30, 2012 from all entries received. I would love to try the La Crème Cow cheese. Thank you for the great giveaway. thanks for the giveaway!! This prize looks awesome! The Parmesan and Peppercorn sound great to me! I'd love to try this cheese. It would be a great prize to share! I'm a cheese addict, so I'd love to try La Creme Cow. Following with GFC (Carley L). Thanks for the giveaway! Would love to try it! Parmesan & Peppercorn. creme cheese. i would love to try the la creme products...sounds yummy. This looks delicious! I'd love to try it. I added you on google+ (Jennifer Lehman). Awesome giveaway, I know we would all love the La Crème Cow cheese. This looks really good, i love cheese and like to try all of them! I am an absolute cheese addict! Thanks for the great giveaway!! The parmesan and peppercorn sounds delish. Would love to try this! I'd love to win, thanks for the giveaway! Mmm! I love La Creme! and would LOVE to win this prizepack! The parmesan peppercorn sounds really good. Thanks for the giveaway,looks delicious! I love this product just for convenience, taste, and lunches. I would love to try the Parmalat's new product.